(April 16, 2018) -- The University of Texas at San Antonio (UTSA) Open Cloud Institute (OCI) is awarding nearly $200,000 in funding through its Cloud Computing Endowment Grant program to kick start UTSA research projects in cloud computing and to provide scholarships to 40 UTSA graduate students in Computer Science, Computer Engineering, and Information Systems and Cyber Security (ISCS) departments, working toward cloud computing-related degrees. This year, the Open Cloud Institute awarded $121,900 to support five projects led by UTSA business, science and engineering faculty. Cloud computing allows computer processing resources and data to be shared on-demand on Internet-ready devices using privately-owned cloud or public cloud providers. By investing in a diverse set of interdisciplinary research projects, the OCI is aiming to facilitate impactful applications in several different realms of technology. Harry Millwater, professor of mechanical engineering, will bring analytics and high-performance computing to the cloud. Millwater will work with digital twin (DT) modeling, which involves creating a living digital copy of a high-value asset such as an aircraft or a satellite that can then be updated in real time. The DT can then be used to predict reliability, remaining useful life, maintenance and repairs of the real asset. DT modeling is also used in simulations for surgeries, medical devices, ship-building and power plant construction. The overall goal of the project will be implementing this technique with high performance cloud computing and providing a more thorough understanding of DT modeling, which could lead to a new generation of cutting edge, effective technology in countless industries. Hatim Sharif, professor of civil and environmental engineering, will conduct smart transportation research using cloud computing. By utilizing computational algorithms in the cloud to estimate crash probabilities based on a set of humans, environmental and roadway factors, Sharif will develop a predictor of crash severity to help Texas improve its infrastructure and more precisely prevent crashes. Jeff Prevost, co-founder and co-director of the Open Cloud Institute and assistant professor of electrical and computer engineering, will create a comprehensive cloud framework to test the cooperation of robots that are working together to accomplish one common mission. The work is a precursor to increased coordination of Internet-of-Things devices that operate on the cloud. Prevost and his students are using swarms of robots to stand in for what could one day be smart devices in the home or at an office. Paul Rad, co-founder and co-director of the Open Cloud Institute and associate professor of information systems and cybersecurity, will use cloud computing as a tool in cyber autonomy and threat analytics. Rad will utilize the cloud to collect data from social media and Internet-of-Things (IoT) devices to employ machine learning algorithms that detects the possibility of malicious behavior. His goal is to stop cyber-physical threats before they happen. Krystel Castillo, GreenStar Endowed Associate Professor in Energy and director of the UTSA Texas Sustainable Energy Research Institute, will incorporate cloud computing into efforts to create a science as a service resource for the clean energy community. Castillo will utilize a cloud-based decision system to help the emerging clean energy industry optimize system performance and market potential while considering the environmental, social and economic implications of that system. As a result, this resource will provide clean energy research and practitioners the opportunity to use optimization model to devise robust designs in a techno-economic sustainable way. 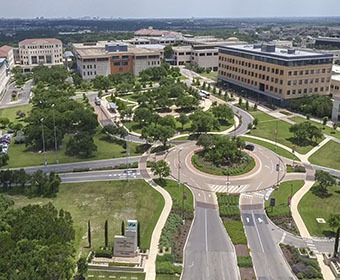 Through the Open Cloud Institute, UTSA also offers a graduate-level certificate program in cloud computing so that students in engineering, computer science, and cybersecurity can incorporate cloud expertise into their degrees. Additionally, the Open Cloud Institute awarded $75,000 in scholarship funds to UTSA graduate students studying cloud computing. “The work that The Open Cloud Institute is doing to support innovative research and the cloud computing professionals of tomorrow is very inspiring. The institute continues to be a hub for exciting, creative research in a world that is increasingly dominated by cloud technology,” said Lorenzo Gomez III, executive director of the 80/20 Foundation. The graduate certificate program, available to UTSA students in the College of Sciences, the College of Business and the College of Engineering, has three tracks. The applications track teaches students how to deploy data and big data analytics within the cloud. The infrastructure track focuses on how to build cloud software. The security track teaches students to create a secure, encrypted cloud protected from hacking or cyber terror. UTSA’s cloud computing certificate program currently serves 22 graduate students. In 2015, UTSA founded the Open Cloud Institute to support cloud computing and big data research and development. The 80/20 Foundation supported the launch of the institute with $4.8 million to support endowed professorships, faculty research positions, graduate student endowments and research funding. The institute’s researchers are helping the international business community improve its computing platforms through open-source cloud and big data technologies such as OpenStack, Software Defined Networks, and OpenAI. It currently includes 15 faculty members and supports 150 students across three colleges: Business, Sciences and Engineering. Learn more about the UTSA Open Cloud Institute.